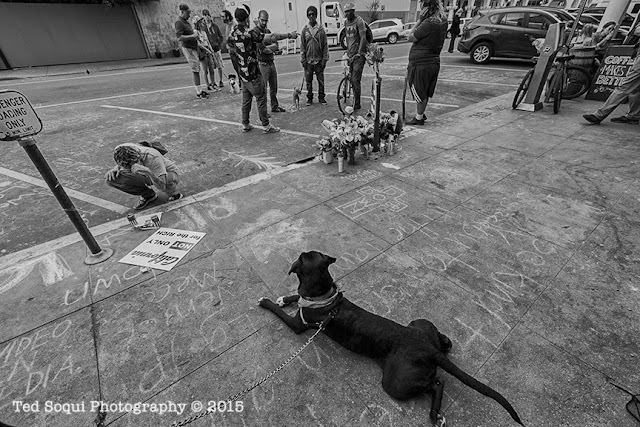 "Dozer" the dog waits sadly and patiently next to the spot where his master, Brendon "Dizzle" Glenn, was shot and killed by a LAPD officer. Glenn was unarmed and a homeless youth that lived in the Venice Beach area. The shooting on Windward Ave. in the heart of Venice, has sparked outrage by the community and LAPD Chief was "concerned" by the officer's use of force during the shooting.